Trailblazer Award partners gathered in Indianapolis to share and celebrate their projects. On April 5 at the beautiful Indianapolis Central Library, CHeP friends and family gathered to celebrate the 2015 CHeP Trailblazer Award teams. The day-long event featured presentations from 12 project teams discussing their partnership experiences, research journeys, and exciting outcomes, as well as an opening address given by Dr. Anantha Shekhar, Director of the Indiana Clinical and Transnational Sciences Institute, and closing remarks from Ann Alley, Director of the Office of Primary Care at Indiana State Department of Health. 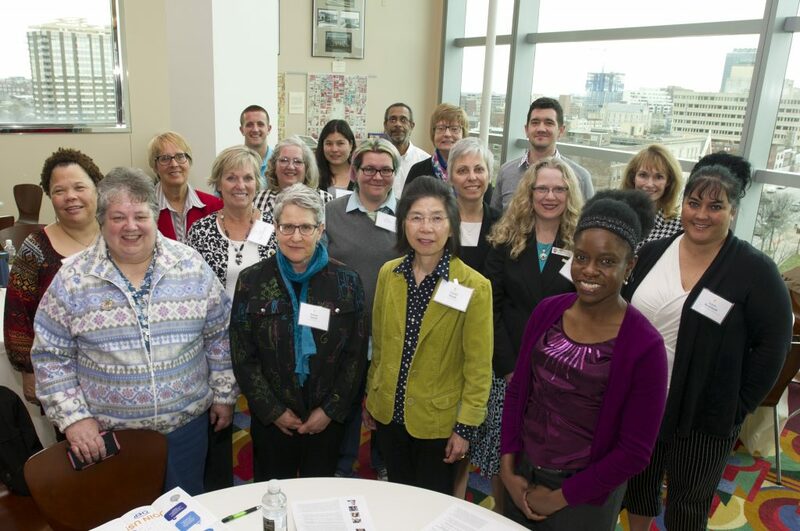 Formerly known as Pilot Projects, initiatives at the symposium included obesity, infant mortality, sickle cell disease, diabetes, an adverse drug reaction screener, quality of life in older adults, and yoga for those with brain injuries. CHeP’s Trailblazer Award is a pilot funding opportunity for community-engaged research projects proposed by community-university partners. All awardees meet quarterly to provide each other support and to create a network as trailblazers in this important field. To learn more about each of the projects, visit the Trailblazer Symposium webpage where you can access descriptions of each project and video of each of the presentations.